I consider myself to be an aquarium connoisseur. Everywhere we go I try to find an aquarium. In fact, I actually plan vacations around aquarium locations. That’s how much I love them. The point is, when I give you my review of an aquarium, it’s totally legit. And thorough. Anywho, I thought it would be easiest to cover pros and cons before talking about our favorite exhibits. There’s a TON to do in the area. Lots of great food, street entertainment in the warmer months, shopping. It’s in an exciting part of town. Parking is terrible. 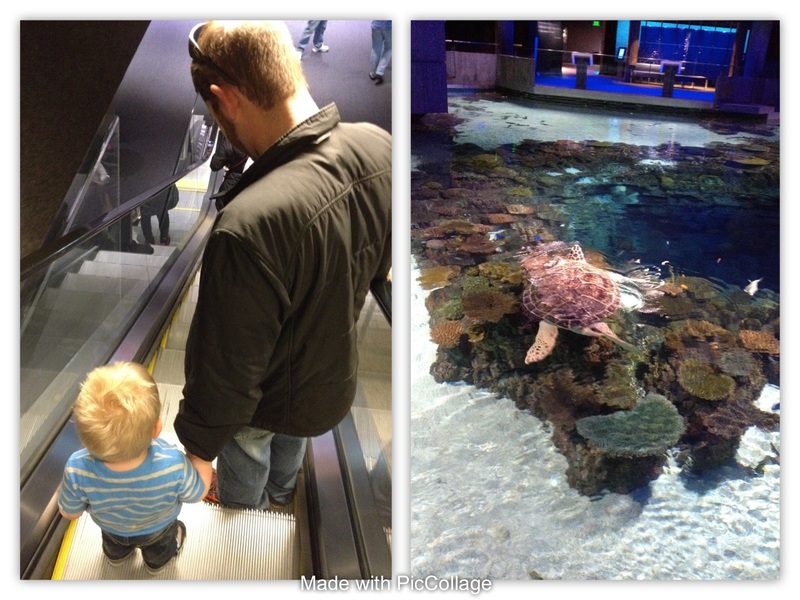 You have to locate a garage, traverse traffic, and it is expensive added cost to visiting the aquarium. No strollers. Seriously. You can’t take strollers through the aquarium because of all the escalators and moving walkways, so if you don’t already babywear, now is the time to start. They do rent carriers there but they are the metal framed ones and may not be the comfiest. It’s $$$. For a family of 4, you’re looking at $130 for tickets. A family membership costs $190, so it’s almost a no brainer to just do that. If you plan on going twice in a year, you will save a good chunk of money. There are no guardrails by the water outside. If you want to hang out by the inner harbor, make sure you’ve got a good grip on your kids’ hands, or a leash. There is nothing to stop your wild two year old from stepping right off the sidewalk in to the water. It gets crowded. And by crowded, I mean you have to buy specific entry times IN ADVANCE during the busy season. Tickets do sell out some days and when you’re inside, expect to stand in line to look at anything during those times. Traffic in and out of Baltimore. We’ve gotten stuck in some really bad traffic jams that doubled our already long trip home. Okay so now that the practical part is out of the way, I can talk about my favorite things at the aquarium. I honestly can’t pick just one but my top 3 are the Amazon tank (bottom left of the above collage,) the jellyfish room and the living reef with the 3 flipper turtle. You probably won’t see every exhibit in one visit unless you spend the entire day there. Despite all the cons, there is something magical about this place that draws me in. Kind of like when you “forget” how painful childbirth is and decide to have another baby. If enough time elapses, I “forget” how awful all of the cons were on our last visit and we go again. 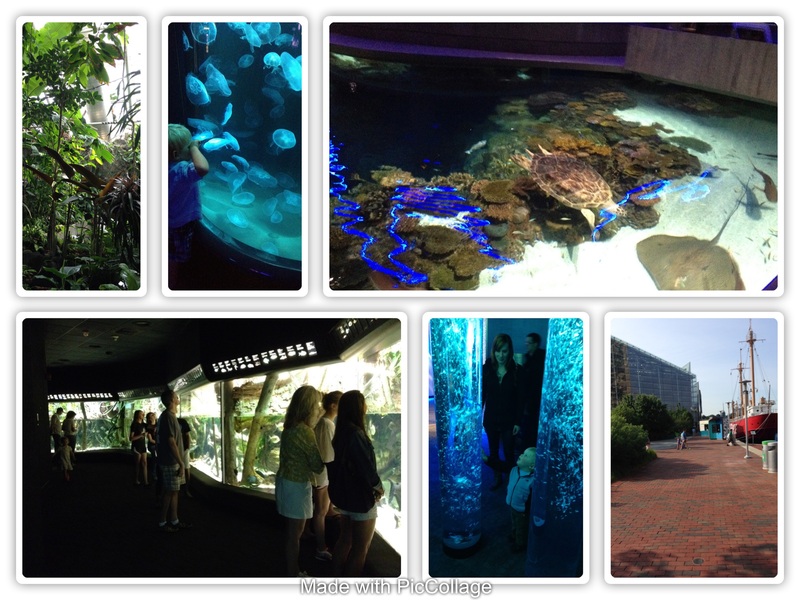 I have been to aquariums all across the country and the National Aquarium still ranks in my top 5 favorites when I consider the aquarium itself and none of the headaches associated with visiting.